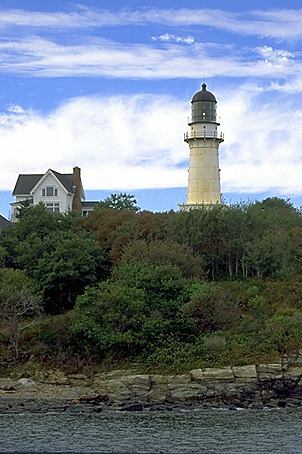 This area of Cape Elizabeth is known as Two Lights. As early as 1828 two stone towers were in operation, roughly 300 yards apart. In 1874 the two stone towers were replaced with 65 foot cast iron towers, painted brown and fitted with second-order fresnel lenses. In 1924 the government decided to convert all twin-light stations two single towers, so Two Lights western tower was decommissioned. Today Cape Elizabeth's tower shines the most powerful light in Maine--a 4 million candlepower flashing white light visible for 27 miles. 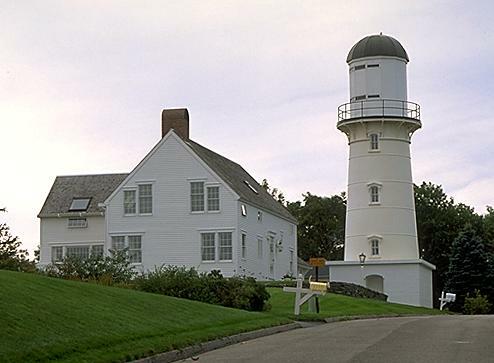 Located in Two Lights State Park, the keeper's house is now a private residence in an excusive neighborhood. The remains of the western tower are down the street in someone else's front yard. Update 1999: The gingerbread keeper's house at the active light has been demolished by the owner, to be replaced by a "replica" with a two-car garage added. 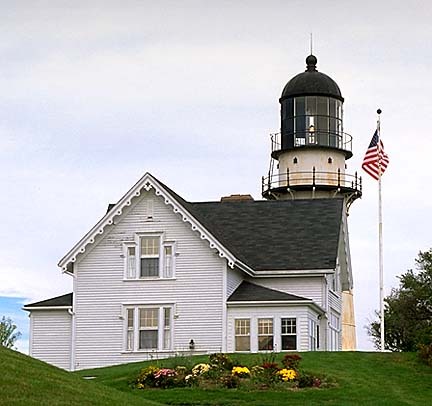 The lighthouse, which is not privately owned, remains untouched.